09 May 2017: Toradex is excited to welcome Christmann Informationstechnik + Medien GmbH & Co. KG from Germany in its partner program. 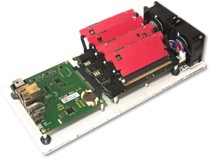 Apalis ARM based System on a Modules are available in different configurations. For example, with the NVIDIA® TK1 SoC with a 4 core Cortex-A15 with 2.1 GHz and a GPU with 192 CUDA cores. The unified memory between GPU and CPU avoids the PCIe bottleneck in data sharing between CPU and GPU. Toradex also announced an upcoming Apalis SoM based on the i.MX 8 from NXP®.